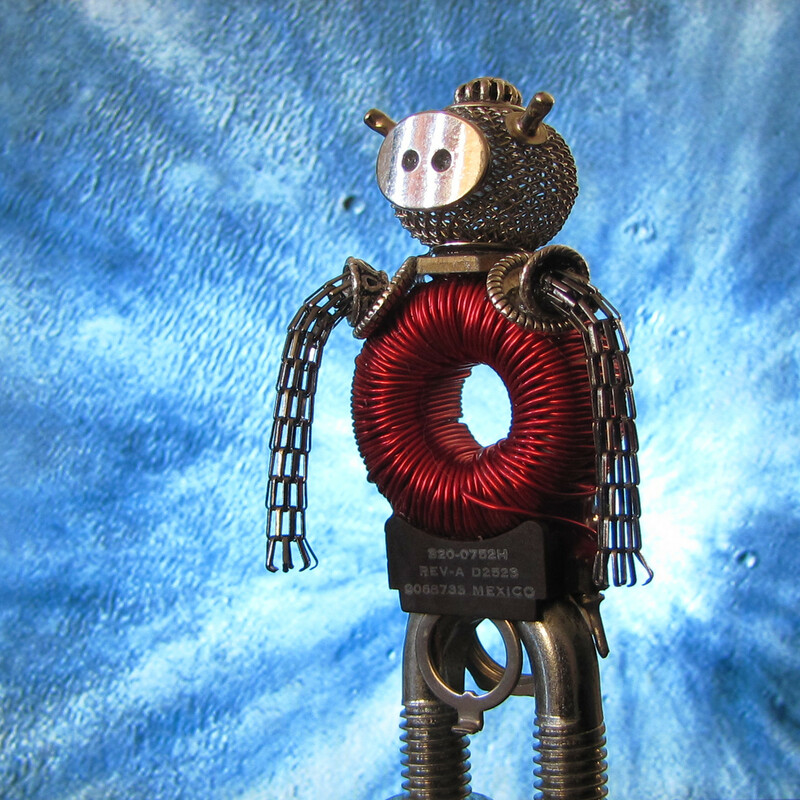 Well after a long hiatus I’m returning to working on art, jewelry and sculpture. Last year I spent 6 months cleaning up my Uncle’s house and what a treasure trove of scrap material it proved to be. One of the nicest finds was a few dusty, filthy boxes of vacuum tubes. They were / are so old many of the cardboard boxes were deteriorating and crumbling to dust. So what to do? 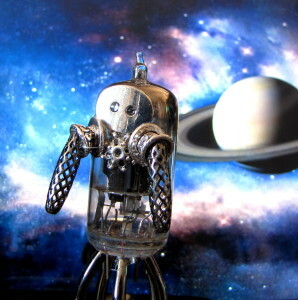 I’ve had some problems with my vision so I needed to look at a few options – and one day I thought: these vacuum tubes look like little robots. I was on chat with a friend and suddenly said, “ROBOTS”. It was literally one of those inspired moments. On the weekend I had an inspiration on how to photograph them on various backgrounds. It took ages to figure out the lighting and backdrops, but I am quite pleased. This weekend I did a new craft show put on by the kind folk who organized the Bazaar of the Bizarre! The new winter show, “Frost Bite”, was in a new location – at The Great Hall on Queen Street. For me it was a great show – lots of vendors who have wonderful work – artists, jewelers, clothing designers and more. The venue was a lot of fun – well spaced out – with enough room to move for the crowds (and yes, there were crowds), and enough space for the vendors too. It almost felt roomy! The lighting was quite good – though the 2nd room had better day-lighting. Unfortunately I didn’t get more then 2 minutes to check it out. Most of my time was spent behind my table talking about the work, and sometimes explaining the Materials. What makes a successful craft show is, for me, a delicate combination of vendors and the general public. The Bazaar of the Bizarre people really seem to have found a good niche – appealing to alternative folk, artists, goths, geeks, punks and anyone who appreciates the unusual. They seem to have selected a good group of vendors. I was parked beside another jeweler – which often happens – since there are so many jewelry makers around. The woman beside me though had a lot of silver jewelry, so it was a good contrast to my own “mixed media” work. I was quite impressed with some of the jewelry at the show – after a while I’ve started to recognize people and their work. The biggest thrill this weekend for me personally was quite unexpected. 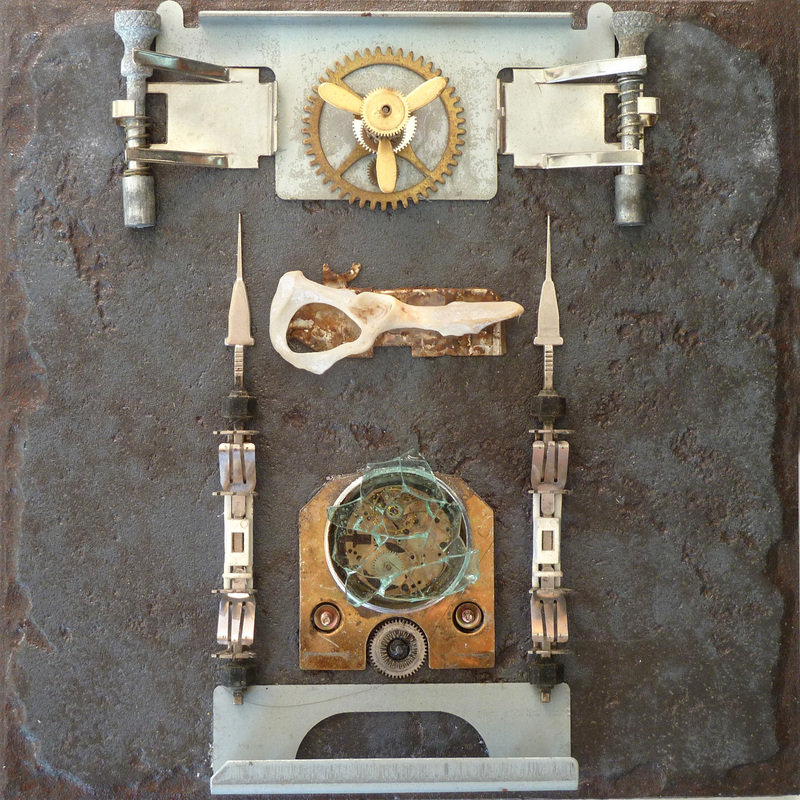 My art piece, “Collapse”, – a wall sculpture was purchased. I honestly was quite unprepared – mostly I had thought people might come and be curious about it – but I didn’t think anyone would actually buy it. I know, silly, but true. I am .. .just thrilled… that it will now be in someone’s home. It was a very personal piece, and I’m so happy someone owns it now. There were a few special pieces too that were sold. I’ve a good memory for some work – one, the customer named, “Bee on time” was a small woman’s wrist watch case with a partial movement inside, and a tiny bee. Another had a lovely brass stamped angel who arched around a mother-of-pearl button, placed on a movement. Two of my Vacuum tubes went – one a very masculine piece – with a thick copper chain. A U-tube necklace made from a stop-motion flash has found a new home. Sometimes I’m amazed some things have Not sold – and sometimes I instantly wish I’d hung on to some just a bit longer. I always love it when a fellow is buying something for his partner at these shows. Often they will circle back and whisper, “psst… that necklace my wife liked….” and I’ll slip it into a box. These are always fun little moments of connection. I think i just enjoy the .. sneakiness of it. 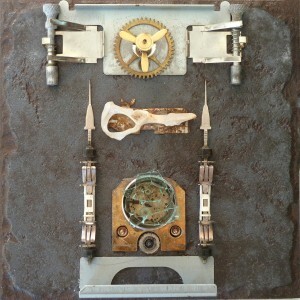 Relic – a found object and recycled art plate is based on the idea of religious relics. Bones of saints were often kept inside churches, preserved and worshipped, tokens of powerful healing, signifiers of the spiritual nature, objects of passion. Central in the piece, Relic, is the bone of an animal place upon a bed of rusted metal. The piece can be interpreted in 3 sections. Topmost we find the industrial “heaven” where a propellor “drives” the gear below. This large gear was taken from a clock I dismantled. The central section has the Relic. 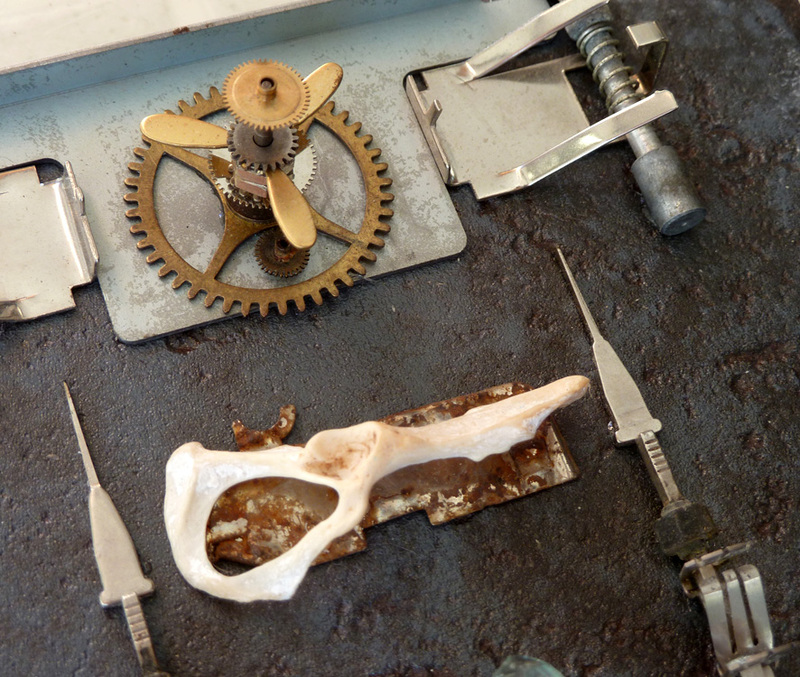 In this industrial detrius world the bone of an animal (hip bone of a mink I believe) has taken on a religious signifigance – everything else is metal, scrap, and hard. 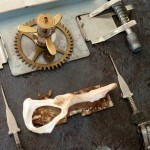 The bone is a reminder of the Natural World. At the bottom is the “church” of technology. A brass plate forms the central section, and two spires flank each side. The Rose Window – is windshield glass taken from the streets and mounted. Behind it is a very rare watch movement made of copper. I have taken apart hundreds of watches for my steampunk jewelry – but I have only ever found 3 copper movements. This is the inner heart of the “church” – a special movement – indicator of technology – and yet relic of the past. We no longer manufacture such movements – only expensive watches are now driven by mechanical, steel and brass workings. Relic is part of the series of “wall sculptures” – these are on these fantastic ceramic tiles that someone threw out here in Toronto. No new parts were used in this – bits and fragments were taken from various machines. I carried home 6 of these wonderful tiles – and my hands ached for days afterwards – it was the middle of summer and the weight of them was difficult.